As a fighter Carl Froch gave all he had to the sport of boxing. Though never the fastest, quickest or strongest Froch simply found a way to win on most nights against the best his division had to offer, and he will be remembered as a true fighting champion in an era where other stars decided to simply rest on their laurels. 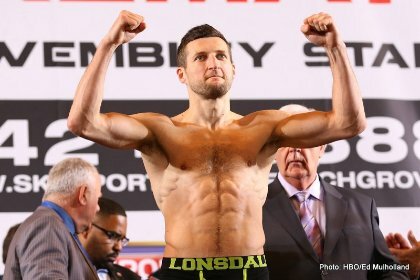 Froch, the former four time Super Middleweight champion and one of the UK’s finest fighters in recent memory recently announced his retirement from the sport of boxing and has signed on with Sky Sports as a fight analyst, already providing top notch commentary for the premiere destination for Boxing in the UK. But now that the dust has settled and the smoke cleared from Froch’s fine fighting career, I thought a retrospective of his greatest pugilistic accomplishments was in order. Froch, whose professional career began on March 16th in 2002 with a 4th round TKO victory over Michael Pinnock at the York Hall, in Bethnal Green, London would eventually go on to capture a version of the 168 pound championship on four different occasions. The first coming in December of 2008 in a vacant WBC Super Middleweight title fight against then undefeated and future lineal 175 lb champion Jean Pascal of Quebec, Canada. Froch would go on to defend that title against former lineal Middleweight champion Jermain Taylor in a memorable 2009 contest in which Froch was actually losing on 2 of the 3 judges scorecards going into the 12th and final round of the contest before landing a dramatic, perfectly placed blow to the head of Taylor to escape certain defeat via come from behind knockout in the waning moments of the fight. Froch would then go on to win a razor thin decision against the ultra talented, former U.S. Olympian Andre Dirrell in 2009 before losing his WBC crown to Mikkel Kessler in 2010, a loss that Froch would later go on to avenge in 2013 and in the process usurp Kessler of his WBA Super Middleweight crown thus unifying it with his own IBF title at the time. Never a fighter or man to show any hint of resignation to defeat, Froch would go on to reclaim his WBC Super Middleweight world title by defeating “King” Arthur Abraham in late 2010 via convincing unanimous decision. After a successful 2011 title defense against a resurgent former 175 lb lineal champion Glen Johnson, who had just defeated heavy favorite Allan Green as a late replacement in Showtime’s “Super Six” 168 lb tournament Froch would go on to once again lose his WBC crown to “Super Six” champion Andre “SOG” Ward in the finals of that tournament. However, Following Froch’s close decision loss to Ward he would never again taste defeat as he went on to stun the then undefeated knockout artist and longtime IBF 168 lb champion Lucian Bute via 5th round TKO in front of his rabid hometown fans in the Nottingham Arena. From that point forward Froch would go on to make four succesful defenses of his IBF title and as stated before avenge one of the only two previous defeats in his career by unifying titles against Mikkel Kessler. Froch went out on the highest of notes in 2014 when at the famed Wembley Stadium in London before 80,000 adoring fans he knocked out young upstart George Groves to put the finishing touches on a fine career. The 38 year old Froch finished with a record of (33-2 24 KO). Froch’s decision to retire was based simply on the fact that he gave all he had to the sport and being secure in his legacy. He was not a shopworn fighter, sadly stumbling off the scene after sustaining beating after beating. No he left the game on top, as a winner; and when historians of the sport sit to talk of Froch’s greatest attributes, his character and fighting spirit that saw him become one of his generations greatest winners will no doubt be discussed. Next stop for Froch, Canastota New York.